I’m covered in dust. I’m thirsty. The sun is beating down. And it’s waaaay past lunch time when we get to Distant Relatives in Kilifi. I stumble from the car to a table by the pool. First things first: an ice-cold beer. K goes to the bar to order, and very quickly my beer appears in front of me, the condensation quickly forming thick drops that trickle down the side of the bottle *bliss*. Next stop: the washroom. I’m having an issue with my knee at the moment, and the bumpy path to the loos is posing a real challenge to me. I hobble down and back up and am glad I only have to go there once. The place is definitely not disability access-friendly. Once I make it back to the table, it’s time to order some food. Unfortunately, the special of the day, tuna steak, isn’t available until dinner. So I settle on the grilled baby calamari in ginger, chili and lime, while K has the king prawns with garlic and herb butter. Other items on the menu include fried chicken, lamb curry, Thai curries and BBQ ribs. The food arrives pretty quickly, and is really good. The portions are generous, and my calamari is tender and not at all rubbery. The chips are crispy and hot, just the way I like them. The meal is served with a refreshing tomato salad on the side. K’s prawns are super tasty as well, but there could be a few more of them. The herb and garlic butter isn’t overpowering or overly greasy. Unfortunately, we have to leave soon after we finish our meal. 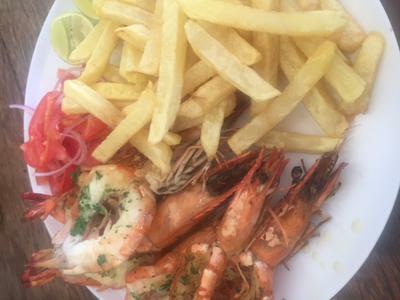 At Ksh 900 per main, the lunch was very affordable, especially considering the great quality of the food!